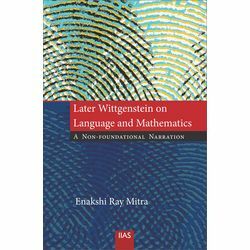 This work takes off with the clear intention of weaving a single anti-foundationalist narrative that will connect the later Wittgenstein’s views on ‘ordinary’ language with those on the ‘specialist’ regime of mathematical language. Some popular notions about his later views—those that confuse his idea of indeterminacy with mere ambiguity, or read him as substituting sociological or physiological foundations for the classical ones, or brand his anti-foundationalism as a form of relativism—are all addressed within this single thematic unity. This book avoids the intensely detailed analyses of technical issues as much as possible, attempting to steer such issues towards epistemological enquiries into the nature of mathematical cognition - creating overall a style of narrative where philosophy of mathematics will be merged with philosophies of logic, psychology and action in an immaculate whole. However, what the author has attempted to achieve against the official foundations of mathematics, in an extremely general and non-technical manner, may hopefully be extended to the standard technical issues of mathematics by experts on the subject. Overall, this book can be used by all readers across all disciplines. It encourages problematising the ‘obvious’ and takes an incisive interest in what constitute the conditions of possibility of language and mathematics.